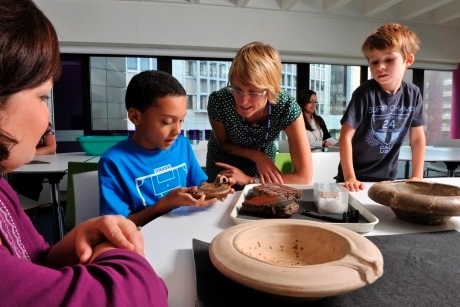 Booking onto the 2016-17 schools programme at The Museum of London is now open for teachers. The Museum of London’s extensive offerings to schools range from gallery tours covering local topics including the Great Fire of London and wartime London, to expert, curator-led sessions with handling of real museum objects. Subjects to learn about include History, Science, English, Art & Design, Business Studies, Geography and Maths, plus others. Key Stage 1 facilitated workshops that can link to History studies include a Walk the Great Fire session, and Around the World with Captain Cook. Walk the Great Fire allows students to explore hidden alleyways, sing songs in a ruined churchyard, admire St Paul’s Cathedral and see the remains of the old City wall. Blue Badge tourist guides will teach children about Local History and encourage question and answer sessions. Meanwhile, Around the World with Captain Cook is a workshop that allows children to ‘meet’ Isaac Smith, the master's mate on Captain Cook's expeditions to the southern oceans and beyond. The group (35 maximum) will make a sextant to take back to school, learn how Cook used scientific instruments to navigate his way around the world, and hear about some of the animals discovered on his expeditions. Teachers of Key Stage 2 pupils can choose from workshops linking to Science, such as an Archaeology for All session or Capital Engineers. Archaeology for All (which can also be adapted for other Key Stages) allows pupils to learn how fragments of history can build up a picture of the past. It will also help to develop the children’s understanding of the River Thames today before delving into London’s past. Alternatively, Capital Engineers focuses more on engineering. The group will ‘meet’ Isambard Kingdom Brunel and investigate the engineering secrets behind some of London's landmarks. Pupils will then solve some of the problems that faced Brunel and his colleagues in a fun hands-on Science activity. School teachers should note that the museum is currently only taking bookings for the autumn term. Booking for the spring and summer terms opens on 1st September 2016. Teachers who’d like to book ahead to next year should call 020-7001 9844 or e-mail learning@museumoflondon.org.uk. For further information visit www.museumoflondon.org.uk/schools.